On-going through May 2014, A Sense of Place, Pier 24 Photography: Featuring over 25 artists and selections from the Sack Photographic Trust, A Sense of Place is an exploration of how photographs shape the perception of our environments. Grand scale photographs, room-sized installations and small quiet photographs transport the visitor through a variety of locations, memories and experiences. Pier 24 Photography is designed to provide an intimate environment to view and contemplate photography. Visits are scheduled by appointment only and are free. Open Monday – Thursday 9 am to 5 pm. Installation view of one of the galleries in Pier 24 Photography featuring Todd Hido, Robert Adams, and Stephen Shore among others. Source: Pier 24 Photography. Saturday, September 7th, Four Galleries Move to Potrero Hill: Moving from downtown to Lower Potrero Hill and setting up shop one block from each other are Brian Gross Fine Art, Catharine Clark Gallery, Jack Fischer Gallery and George Lawson Gallery. These galleries will join Hosfelt Gallery which moved last year to Utah Street. Join all of these galleries as they open their inaugural Fall exhibitions on September 7th from 4-7pm. Brian Gross Fine Art will feature Ed Moses; Catharine Clark Gallery opens a group exhibit curated by Anthony Discenza This is the Sound of Someone Losing the Plot featuring nine CCA faculty and alumni artists; Jack Fischer Gallery will feature an exhibition of works by Ward Shumaker; and George Lawson Gallery opens with an exhibit of new paintings by Erin Lawlor. Hosfelt Gallery’s Fall exhibit is a solo exhibition of new paintings by Stefan Kurten. All Galleries are within a block from 16th and Potrero. Ed Moses at Brian Gross Fine Art, Stephanie Syjuco at Catharine Clark Gallery, Ward Shumaker at Jack Fischer Gallery, Erin Lawlor at George Lawson Gallery and Stefan Kurten at Hosfelt Gallery. Thursday, September 12th – December 14th, Energy That is All Around, curated by Natasha Boas, Walter and McBean Galleries at SFAI: “This exhibition features early and formative work by five artists – Chris Johanson, Margaret Kilgallen, Alicia McCarthy, Barry McGee and Ruby Neri – who began their careers in the early 1990s in San Francisco’s Mission district and, by the early aughts, had been identified and celebrated as key members of the so-called Mission School. This exhibition takes a focused and unprecedented view of an art movement that has garnered cult-like status over the last two decades, by looking closely at shared formal concerns in the painting and studio practice of these five artists–friends and collaborators who attended or were associated with the San Francisco Art Institute (SFAI). The exhibition connects works and ephemera produced at the beginning of the artists’ careers, much of which has remained in the personal or peer collections, with vibrant new work created for this show.” ~ www.sfai.edu The Opening reception is Thursday September 12th from 7-10 pm, SFAI, 800 Chestnut Street. Chris Johanson “This Conceptual Art is an Energy Explosion About Positive Energy”, 2005; Ruby Neri Untitled, 1995; and Alicia McCarthy Untitled, 2006. Source: San Francisco Art Institute. Saturday, September 21st, 4 – 10 pm 39 Forever! Southern Exposure’s Birthday Block Party: This event marks Southern Exposure’s first 39 years of unwavering commitment to visual artists with a party on Alabama and 20th Streets. The afternoon and evening activities feature live performances in conjunction with the opening exhibition The Long Conversation. 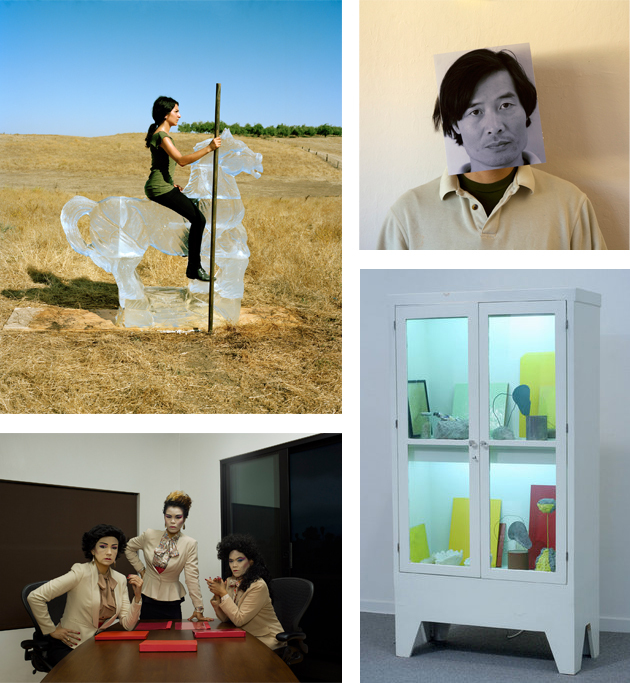 This large-scale group exhibition and performance series presents work by current and former Bay Area artists whose practices are rooted in the strategies of the West Coast, alternative, idea-based, experimental and time-based artwork pioneered in the 1970s. This cross generational project includes artists working the Bay Area since the 1970s as well as a new generation of artists staking claim with experimental, conceptual and engaged methods. The exhibit runs from September 12 – October 26 with many events and performances. Bessma Khalaf “Monument” 2008, still from video; Michael Zheng, “You Talking To Me?” 2013, performance to take place at SoEx; Mail Order Brides, “Conference” 2013; and David Ireland, Untitled 1989/2006 mixed media. Source: Southern Exposure. Saturday, September 28th, Station to Station, 16th Street Train Station, Oakland: Starting in New York on September 6th, a train, designed as a moving, kinetic light sculpture, will broadcast unique content and experiences as it travels across the country through September. The project, organized by artist Doug Aitken makes it’s last stop at Oakland’s historical 16th Street Train Station with an evening of performances and installations. Station to Station will connect leading figures and emerging creators from the worlds of art, music, food, literature and film for a series of cultural interventions and site-specific happenings. Get your tickets here for this public art event on September 28th at 6:30pm.